We have incorporated a new Crest Ultrasonic Vapor cleaner for our optics. 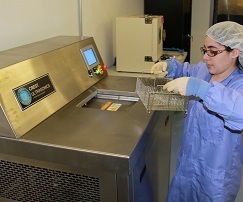 The automatic cleaning equipment allows us to more efficiently process parts and increase our volume of production. In addition, the automated system provides very repeatable results which are essential to assuring quality for large orders. This system utilizes a specially formulated solvent that effectively removes strongly adhered particulates at the micron level. 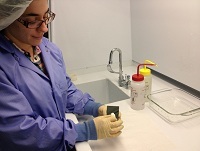 The technology helps IMPhotonix stay competitive by lowering the direct labor cost for coating optics. Lab Technician, Peter Newton, is now in his fourth year working for IMPhotonix. Peter’s background in solar panel manufacturing has allowed him to introduce ideas which have made the lab run more smoothly. Peter continues to expand his knowledge of thin film coatings and has become a valuable employee. 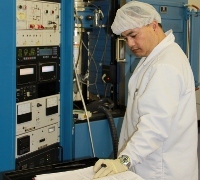 His concern is that our customers components receive the best production quality we can achieve. We rely on Peter to keep the coating chambers running at peak performance. In addition to being a top technician, Peter is also very personable and has helped train new employees. The optics industry continues to rely on Scratch Dig specifications for surface quality. A detail of inspection specifications can be found in the Performance Specifications of Mil-PRF-13830B. At IMPhotonix, our technicians are trained on how to properly use a microscope and fiber optic illuminator to inspect for surface defects such as scratches, digs and stains. By using various combinations of microscope magnification and illuminations they can identify defects ranging from 10-5 to 80-50 scratch dig. 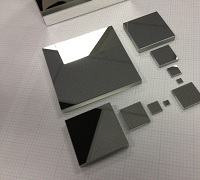 We use a quality inspection scale of 1 to 5 depending on the scratch dig requirements for the optics.